In my journey to test and evaluate firearms related gear, I get to come across some truly unique products. 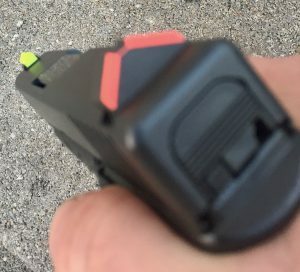 While working on a comprehensive analysis of many different defensive handgun sights, I explored two sets with an intriguing concept for acquiring quick sight alignment and sight picture. I had the chance to take an in-depth look at two sight systems from Advantage Tactical that are different from anything else you may have seen. The concept comes from the inventive mind of company president Richard Nasef and is a revolutionary aiming method based on the human brain's natural ability to quickly recognize geometric shapes. They utilize a sight alignment process that involves creating a triangle or pyramid shape. They figured out that the human brain works great when evaluating linear objects and geometric shapes. 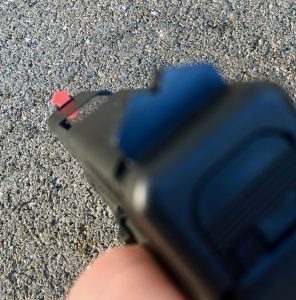 The concept is simple: by aligning two legs of the isosceles triangle (rear sight) with the top point of the triangle (front sight) a triangle forms and the result is a properly aligned firearm. 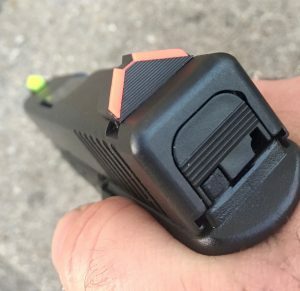 Advantage Tactical has two different models of sights that vary slightly in design and options, but both sets use this simple yet innovative method for alignment. 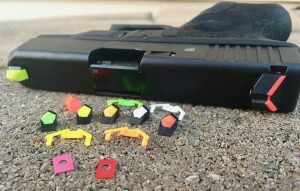 I installed these sights on my trusted Glock 27, but they are available for many different handgun models. They came with the necessary tools to install the product, and it goes on easily. The front sight uses a set screw to hold it in place, and the kit comes with the necessary driver. The instructions recommend having them installed by a professional, and I would agree that if you haven't removed or installed pistol sights in the past, it is probably best to leave it up to a gunsmith. However, I have had quite a lot of experience doing this and found this process to be one of the easiest to date. I used a sight pushing tool to remove and install the rear, which made it much easier than trying to remove or install them using a drift. I did want to mention that while I am evaluating these from a defensive pistol standpoint, Advantage Tactical makes similar ones for rifles as well. I included some video of me shooting with the sights so you can see them in action. The ATPS uses a windage-adjustable black rear sight with two colored inserts forming the legs of the triangle. The front sight is elevation adjustable (by use of included shims) and made of a colorful pentagon shape, that when properly aligned with the rear sight, completes the pyramid shape. 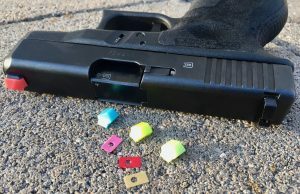 The rear sight is made of metal, with the colored inserts being plastic. The front sight is made of a plastic insert that is held in a metal housing. The neat thing about it is that you can customize the color combinations between the front and rear sights. Both the front and rear sights come standard with several colors as follows: orange, lime, coral, yellow and white. This allows the user to adjust the colors to create the color contrast between them that best works for their vision. While I don't have compromised vision, the ability to change colors has been proven to help shooters that may have decreasing vision due to old age. You can upgrade the front sight to the new ‘firefly.' The firefly, while not fiber optic or tritium, glows in the dark after being charged under natural light, and is said to hold a charge for around 6 hours. They come in a coral and lime color. After messing around with color combinations, I installed the lime colored firefly front sight, and the coral colored rear sight because it seemed my eyes responded best to this combination. First off, I have to point out the obvious. These sights look like no others I have seen. That may appeal to you or you may be totally turned off by its appearance. Personally, I am pretty conservative on the look of my firearms and it took me some time to get used to seeing such a colorful and unique sight on my gun. After I got used to the appearance it didn't bother me. It was an attention getter, though, and whenever someone saw them I was asked: “WOW, what are those sights on your gun?” Aesthetics really don't matter to me all that much. What's most important, is the piece of gear works. Second, the front sight is large. So large, in fact, that it may rub on your chosen holster. I tested this with several holster types. None of the kydex holsters touched the sight, but I did have one leather holster that rubbed on the front sight. It shouldn't be an issue for 90% of the holsters out there, but I did want to mention it. As far as accuracy goes, I was really able to get good slow fire accuracy at distances past 20+ yards. At closer distances, I mainly placed the front sight on the target and squeezed. It took me some time to get used to where I needed to put the front sight in order to get good shots on target. You can see in the below video that my very first shots were from 10 yards. Not as tight as I usually shoot but certainly not bad for the very first shots with a completely different sight picture. The instructions mentioned that sometimes the point of impact (POI) can be a little high. I found this to be the case for me. I found POI was just slightly above the tip of the front sight (maybe 1/2″ at around 10 yards). I removed the front sight and installed one of the included shims, and that brought my POI pretty much right on the tip of the front sight. I imagine a gun with a longer distance between front and rear sights may not have this issue, but because I was shooting the 27, which is a subcompact, this may have been a factor (or it could just be the way I perceive the sights). After about 100 rounds I began to feel more comfortable. It should be noted that whenever changing your sights it will take some time to ‘reprogram' the way your eyes and brain perceive your new sight picture as you'll see in the video, below. I noticed they were very bright, and I think this would be a tremendous help for folks with some near-sighted vision trouble. The brightness was good for the front sight, but for me, I am used to a blacked out rear sight. I found my eye being drawn to the rear sight sometimes. The front sight did keep its glow for quite some time, however, I would love to see Advantage Tactical come out with a self-illuminating tritium version. Overall I fired roughly 200 rounds with this system and can say they are quick for getting sight alignment and sight picture. The triangle shape was just really easy to produce and repeat. Similar to the ATPS the ATDDS utilizes a black iron sight, however, there are no colorful ‘legs' of the triangle. The front sight is the glow in the dark firefly pentagon shape. 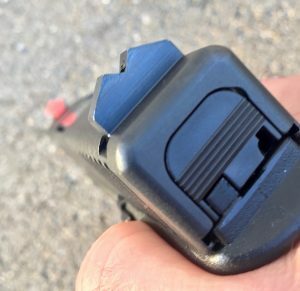 The way sight alignment is achieved is simple: The notch in the rear sight allows the front sight to form a perfect diamond shape when properly aligned. The idea is that because the front glows in the dark, that in bright light or even low light situations, as long as the shooter sees a diamond shape on their front sight, their gun has sight alignment. The rear sight is completely black, and this appeals to me as someone who doesnt like a lot of flair on my rear sight. I prefere completely blacked out rear sights. One thing I noticed is, while the rear sight is a flat black color, the fact that it is a smooth texture, could still create some slight reflection, which could cause some fuzzyness in extreme bright light. I would like if they would go with a serrated finish like on the pyramid sights. It would eliminate any possibility for light to reflect off the rear sight. Like the ATPS, the ATDDS comes standard with different color front sight inserts. The standard colors are yellow and coral, with an aqua and lime green color available as an add-on. They also come with a shim kit for the front if you wish to adjust the point of impact (POI). I installed the coral colored front sight for this evaluation. I ran the ATDDS through a similar evaluation as I did for the ATPS. I shot some targets at self-defense distances, 5-20 yards and then some slower more accuracy-focused shots at 20+ yards. These were the second sights I tested from Advantage Tactical, and I think by practicing with the ATPS first, helped transition me to this ATDDS sight picture as they are similar (but not the same). I really liked the simplicity and intuitiveness of placing a diamond on the target and squeezing the trigger. Even at distances of 20+ yards, this was very easy to do. Again the large front sight was perfect when shooting up close if I needed it. Another thing I noticed about the rear is that it has a flat face. This is something that some self-defense shooters will like because it allows a one-handed rack of the slide on your boot, belt or another hard object in a pinch. Shooting the ATPS sight first let me have an idea that I may have to install a shim to move my POI down slightly, as I had to do this on the ATPS. So I started by installing the clear shim and was pleased that my POI seemed to be right on. 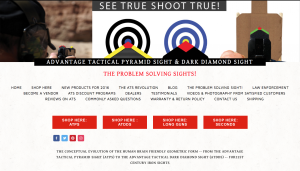 Whether or not it was the practice I had with the ATPS, the completely black rear sight, or my mind's preference for the diamond versus the triangle shape, I seemed to shoot the ATDDS better out of the box. Both the ATPS and the ATDDS are viable sights for self-defense and competition shooting. The sight picture on both sights is intuitive. I found these sights are terrific for people who struggle to keep both eyes open while shooting. It is very easy to get good sight alignment and picture with both eyes open, so people who struggle with this may find these sights appealing. The different color combinations is a truly unique feature, and I have to say way overdue. Being able to customize your color combination (or front sight color for the ATDDS) really allows you to get exactly what works best. I think the ATDDS will appeal to those shooters who have already transitioned to a bigger front sight and blacked out rear sight. Advantage Tactical is looking at gun sights in a whole new and innovative way, which is a wonderful thing for the industry. I know that sights are a very personal decision and it is difficult to really know what you will like without trying it. With the price point at under $100, many color combinations, and two different sight picture options that Advantage Tactical offers, you can afford to try out the sights without going broke. Click here to find out more about Advantage Tactical products. As with all of my reviews and articles, I love to receive your feedback. Let me hear what you think and leave a comment, or tell me about some gear you would like to see reviewed. Stay safe and God bless. Thanks for reviewing these sights! I’ve been interested for a long time. It would be great if three was a picture or short video displaying sight picture of them both, but especially atdds on low light. Hello I thought the video was great. Thanks for reviewing these sights! I’ve been interested for a long time. It would be great if there was a picture or short video displaying sight picture of them both, but especially atdds on low light. Finally, what about the Brave response holster, any issues? Thanks for the comment, and let us know if you decide to buy the holster. I personally own one, and it is comfortable. Hi Sean, glad I could help out with the sights. The sights are unique but very functional. If you go on the Advantage Tactical webpage, they have some good photos of the sight picture, sorry I didnt get any low light video, but that is a great idea. Ill see what I can do. As far as the Brave Response holster, I continue to like it. It is not my everyday carry holster, as I have a kydex holster I usually carry in. That being said, whenever I am wearing athletic shorts or pants (which is quite often in the summer) I wear this holster. It still is the most comfortable holster for me for those times. It has held up quite well. The elastic is a little stretched out from me wearing it so often, but it hasent effected the way the holster works or the comfort of it. As far as the nylon of the holster, it is just as good as when it was new. Matthew, this is a really interesting one to me because I look at these sights and think there’s no way I could get used to them. But it seems that it’s perhaps one of those try it first and find out you like it sort of things, maybe? So a big question here for you is: did you like these well enough that you are going to leave them on your gun? I completely understand what you are saying with the weird design. I am really old school on a lot of things, and still have iron sights on my AR, so I get your apprehension. I have to say it really is intuitive and once you get used to a completely different way of using pistol sights, it becomes quite fast. As far as leaving them on my EDC gun, I absolutely would keep the dark diamond sights on my EDC. These ones were the most intuitive for me. I have been switching out sights on my guns so much recently as I have been compiling a bunch of defensive handgun sight reviews, so I still have my XS Big Dot sights on my EDC gun at the moment though. If we can ever hang out and go shoot, I will gladly let you check em out! We thank Matthew for writing a thoughtful, fair and thorough review. A gun sight may only be truly measured when a base line has been established. A rather larger police department in Calif. introduced new recruits, many of whom had no experience with firearms, to a variety of different iron sight systems. According to their findings, all did better with Advantage Tactical Sights, in comparison to alternatives. We have replicated this several times with new shooters. When new shooters are divided into two groups — one using traditional sights and one using the ATS’s, those new shooters were able to shoot a “decent” group within a few magainzes. Those using traditional sights took weeks to duplicate the ATS users. Of course, most are not new shooters and many have built solid skills with traditional sights. We are just making the claim that our ATPS and ATDDS are the most intuitive sights available. I handgun hunt most of the time, with open sights. I don’t mount a scope on handgun. I have experimented with numerous sights, especially those that Elmer Keith wrote about. These sights in your article are worth trying. I like the sight picture. Hello I thought that it was interesting. I would like to know how much it cost. Hi Warren, Check out their web page https://advantagetactical.com/ and you can price out the sight for your specific gun. Thanks for the message!